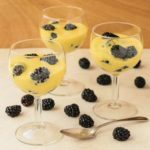 A recipe for zabaglione, an Italian custard made of egg yolks, sugar, and Marsala wine. It is served warm or chilled with berries, biscotti, and more. Bring about 1 inch of water to a boil in a saucepan. In a large heatproof bowl, add the egg yolks and sugar. Beat using an electric mixer on high speed until mixture is light and the sugar is dissolved, about 4 to 5 minutes. Scrape down the bowl during mixing to incorporate all the sugar. Add the Marsala, salt and nutmeg to the bowl. Lower the heat to the saucepan to bring the water to a simmer. Place the bowl over the simmering water. Make sure water is not touching the bottom of the bowl. Beat mixture on medium speed for about 13 minutes, until it is thick, about triple in volume, and registers 165 degrees F on an instant-read thermometer. Remove bowl from pan. Add vanilla and beat to combine. Serve immediately or chill completely before serving. Serve with fresh berries, biscotti, or your favorite custard topping or add-in.